© Nintendo of America/TNS/TNS Nintendo announced the latest entries in the Pokemon series, Pokemon Sword and Shield, during the latest Pokemon-themed Nintendo Direct. Nintendo announced the latest entries in the "Pokemon" series, "Pokemon Sword and Shield," during the latest Pokemon-themed Nintendo Direct. 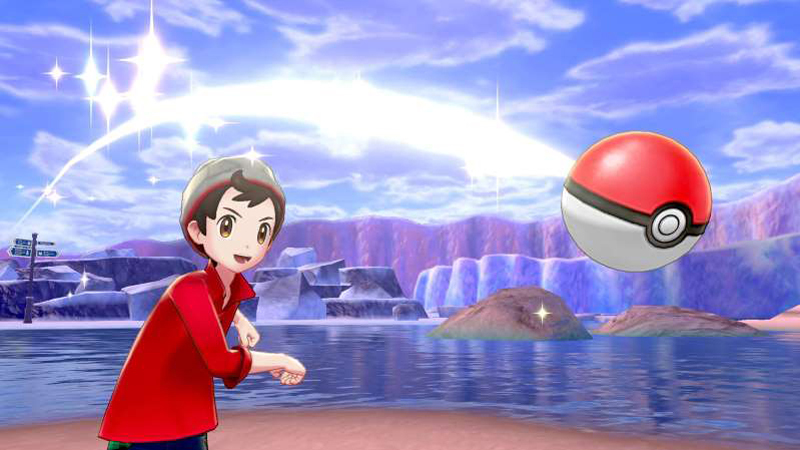 "Pokemon Sword and Shield" take place in the newly-designed Galar region, which will feature a wide variety of different environments to explore. Trainers will be able to walk the countryside, check out the big city, traipse through the forest, and hike through snowy mountains. The people of Galar live and work together with their Pokemon, and it looks like a peaceful, idyllic place. There are three new starter Pokemon as well, of course – Grookey, Scorbunny, and Sobble. Grookey is a Grass-type Chimp Pokemon, Scorbunny is a Fire-type Rabbit Pokemon, and Sobble is a Water-type Lizard Pokemon. All three look like they're going to very quickly transform into formidable second and third stage evolutions, so it'll be interesting to see how that shakes out. It also appears that many things that fans may have been frustrated with in the past with the "Pokemon: Let's Go" series have been resurrected for these new Switch titles, such as random encounters. Early footage seen during the Direct and the first trailer suggest that walking in the tall grass can absolutely trigger Pokemon battles. It's unclear what other mechanics may be making a return or getting reworked at this time. "Pokemon Sword and Pokemon Shield are the latest exciting adventures in the Pokemon video game journey that began twenty-three years ago on this day," said Pokemon Company CEO Tsunekazu Ishihara. "Since then, Trainers around the world have discovered new Pokemon, engaged in epic battles, and made countless memories along the way. We look forward to continuing this journey by exploring a stunning new region in the Pokemon universe when the games launch later this year on Nintendo Switch." Pokemon fans have had plenty to get excited about recently, with a new "Detective Pikachu" trailer and "Nintendo Direct." Both games are targeting a worldwide release exclusively on Nintendo Switch later this year.